The Elsyl Range of hotel conditioner is a beautiful range of products which any hotel guest would be delighted to have in their bathroom. Each Elsyl 40ml hotel conditioner bottle has a neutral coloured label with an aluminium lid making them a beautiful product to have in your hotel bathroom. 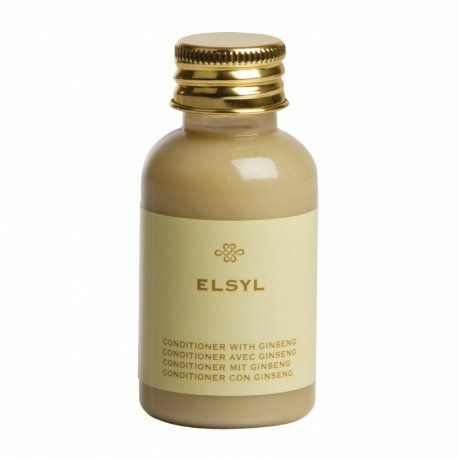 Filled with a beautiful and refreshing "cream coloured" conditioner. Containing ginseng which helps in the treatment of weakness and tiredness to help any hotel guest feel refreshed and revitalised; this is what sets the Elysl range apart from the normal hotel complimentary products available. Matching hotel soap, shampoo, body lotion and shower gel also available.